Check following picture to explain the difference of otoscope and oto-endoscope. 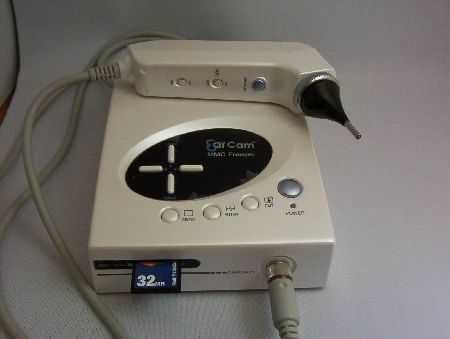 - VIDEO OTO - ENDOSCOPE for Otologists , ENT specialists, Hearing specialists, and veterinarians! If you still use old type otoscopes you have to see the difference that video oto-endoscope can provide for you diagnostics. Your view is broad, your image is bright and optically close. You see EVERYTHING in the ear and nothing is missed. * Complimentary free USB SD-cardreader included. * Complimentary image reading software. We are endoscopic equipment company - Medit Inc, Canada. Check our feedback for satisfied professionals' reports. All endoscopes are brand NEW, with 1 year manufacturer's warranty. 15 days money back if endoscope would not be in use. Try Andale Gallery. Now with Brand New Themes.